Universal Truth #3. Death is Inevitable … Read it and Weep, People! Death WILL call on us all… sooner or later, somehow or other – we all will die. The inevitability of death is a truth that has haunted us, the living, since time immemorial. It may well be a sad truth, a dark truth, an unpalatable truth and yes, a brutal and truly terrifying truth – but it is still a truth nonetheless. There is no escaping the fact that death will inevitably follow life and that life means death, life is death. We may try and do all we can to extend our lifespans, to put off that inevitable death as much as possible, but in the end we – even the most healthy and long-lived among us – are all going to die. In the game of life we will all be dealt the Death card eventually. Death is all around us, ever-present and always an imminent possibility. Our hearts will still and our brains suffocate, our bodies will rot and our minds be snuffed out. Bones will turn to dust and our ashes return to earth. All our relatives will die, all our friends will die and all our foes will too. Everyone will die, every one you have ever known and every one you haven’t, past, present and future – they all die… WE all die. It is the surest end that awaits everyone – it is the great equaliser, rich and poor, the wise and the foolish, lovers and haters, they all yield to death just the same. Homer’s Iliad, c, 750 BCE, reiterates that all are equal before death. So saith the ancient Greek lyric poet, Ibycus (c. 6th century BCE)… and who are we to argue, it was true then and it is true now. From the Biblical Book of Psalms (c. 5th century BCE), King James Version (103:14-16). The Hindu Sage Vyasa – from the Bhagavad Gita (c. 5th – 2nd century BCE). Note that Hindu’s believe in reincarnation, hence the as birth is for that which is dead. The ancient Greek philosopher Epicurus (341 BCE – 270 BCE). So said Seneca the Younger (c. 4 BCE – 65 CE), a Roman philosopher, statesman, dramatist, and humorist. The Alexandrian poet, Claudius Claudianus (c. 370 CE – 404 CE). From the Rubaiyat of Omar Khayyám (1120 CE) by the Persian mathematician, astronomer, and writer Omar Khayyám. William Shakespeare (1564 – 1616 CE). That’s right – every last one of us – we, and every living thing, all shall die. English poet, John Donne (1572 – 1631 CE). Nothing, John, nothing. Oh, and I’m pretty sure if someone did get out of a winding sheet – they weren’t dead. Italian actor and writer, Molière (1622 – 1673 CE). We can only hope that the dying is short, for it is most certain that the death itself will be a very protracted affair indeed. Italian Proverb. We may not all be born equal under the sun, but we’ll certainly all die equal – as we take that dark, moonlit path into the unknown realm of the dead. From the Lays of Ancient Rome (Horatius, XXVII) by Thomas Babington Macaulay (1800 – 1859 CE). The British Poet Laureate, Alfred Lord Tennyson (1809 – 1892 CE), waxing lyrical. English poet, playwright, novelist, and critic, Algernon Charles Swinburne (1837 – 1909 CE). Lebanese poet Khalil Gibran (1883 – 1931 CE). American writer and artist, William S. Burroughs (1914 – 1997 CE), keeping it real! American musician, Irvin Kauffman (b. 1936 CE). You start as nothing but a fleeting gleam – glimpsed betwixt your parents… then you’re born, you live and die all to soon… only to be ranked among a lost legion of forgotten dead for the rest of eternity. Well, at least that’s something to look forward to. But, what is it – to be dead? Is it a sweet repose or a cold oblivion? Is it painful to be dead? Is there a form of life after death? Does a spark of self continue, a soul or spirit? Eternal questions that we will never know the answer to, can never know… except, perhaps, at the point of our own demise. No one has ever come back from the dead to tell us what it is like. To be sure, you can be saved from dying and be “brought back” to life, for you are only near death, but you can’t be saved from death itself… there is no coming back from that. Acceptance of one’s own mortality is the first step to Wisdom… forcing you to “Know Thyself” and to be all too aware of your own limitations. You must accept the inevitable for the inevitable will accept you whether you accept it or not. It is the first lesson at the School of Hard Knocks and it is the foundation stone on which the University of Life, the Universe & Everything is built. Check out the Universal Truths #1: Moderation is the Key HERE and #2: Knowledge is Power HERE. The fourth Universal Truth, Time is Inexorable – will follow in due course. Know your friends, know your enemies, know your environment and know your limitations! They say that a little knowledge is a dangerous thing, but a total lack of knowledge is far more dangerous. They also say that ignorance is bliss, but that’s because the ignorant don’t know what’s coming… better to know what’s coming so you can prepare for and, if at all possible, avoid or at least mitigate it. The more you know about the people and the world around you, the more prepared you are for any given situation and the more power you have to deal with it. Knowledge is the psychological result of perception and experience as well as the result of learning and reasoning. It can be the (technical) know-how and skill required to do something as well as the sum of actual information that a person (or body of persons) possess. The possession of knowledge gives you the power to use it. It is undeniable that one’s potential and abilities are improved by knowledge, and through that one’s reputation, influence and authority (and therefore one’s power) are increased. The earliest written reference that links knowledge and power is from the Biblical Book of Proverbs 24:5. In its original Hebrew (circa 1st millennium BCE) it reads “גֶּבֶר-חָכָם בַּעוֹז; וְאִישׁ-דַּעַת, מְאַמֶּץ-כֹּחַ”. The English translation given above is from the King James Version, 1611. “Your power comes from your knowledge”. The Persian poet Ferdowsi wrote this as “توانا بود هر که دانا بود” in his epic Farsi poem Shahnameh (Letter of Kings, circa 1st millennium CE) which tells the mainly mythical, and to some extent historical, past of the Persian Empire from the creation of the world until the Islamic conquest of Persia in the 7th century. It is an important text to adherents of Zoroastrianism, the state religion of the pre-Islamic Iranian empires from around 600BCE to 650CE. Although often credited to Francis Bacon it seems the first written variation of this (perhaps now clichéd) phrase appeared in Arabic as “Knowledge is power and it can command obedience”. These words were attributed to Imam Ali (599-661 CE) within the 10th century collection of his sayings The Nahj al-Balagha by Sharif Razi (970-1015 CE). Thomas Hobbes (1588 – 1679), artist unknown. It is also the standard English translation of the Latin phrase “scientia potentia est” which was first penned by Thomas Hobbes in part one, De Homine, of his Latin rewriting of Leviathan in 1668. It did not appear in his earlier English version of 1651. The nearest Bacon came to writing anything similar was in a passage referring to God, “knowledge itself is (His) power”, in his own Latin work Meditationes Sacrae (1597) in which it appears as “ipsa scientia potestas est”. Knowledge or intelligence achieved in advance of an event or eventuality allows for proper preparation, and therefore the power, to deal with and overcome that (or similar) event or eventuality. That’s why intelligence and information gathering is vital to any endeavour or pursuit. From Ralph Waldo Emerson’s essay Old Age that was included in the collection Society and Solitude (1870). Knowledge comes from observing everything you come across and learning from it – look and learn. See what works and what doesn’t then repeat what works and perfect it – practise makes perfect. “Wissen ist Macht, geographisches Wissen ist Weltmacht” became a popular phrase in Germany after the 1871 unification and was often used to support efforts for a German colonial empire after 1880. After the disaster of World War One proponents of this geopolitical concept hoped that the Machtergreifung (the Nazi seizure of power) in 1933 would lead to an increased role for Germany as a world power. It certainly seemed, for a while, that this would be so. Ironic, then, that it was the British mastery of knowledge (through secret technologies (like radar) and superior intelligence and information gathering) that played a major part in the Nazi regime’s defeat by the Allies in World War Two. The modern German electronic warfare unit, Bundeswehr Bataillon Elektronische Kampfführung 932, in Frankenberg uses the already mentioned Latin phrase “Scientia potentia est” as its motto. The motto of the Scout movement since 1907 “which means you are always in a state of readiness in mind and body … by having thought out beforehand any accident or situation that might occur, so that you know the right thing to do at the right moment, and are willing to do it.” Robert Baden-Powell. The motto of the fictional Druids (an order of historians, philosophers, magic-users, teachers and researchers) in Terry Brooks very successful Shannara series of fantasy novels (1977 onwards) reiterates that power is achieved through knowledge and demonstrates how prevalent the notion has become in modern popular culture. Is there such a thing as too much, or even dangerous, knowledge? Lets consider knowledge in terms of the previous Universal Truth “Moderation is the key to Happiness”. It would suggest that too much knowledge must be a bad or negative thing – this may seem counter-intuitive… but is it? With these words – originally spoken by John Dalberg, 1st Baron Acton, in 1887 – we are given the vice that an excess of knowledge will lead to – corruption… so maybe it is possible to know too much. This Friedrich Nietzsche (1844-1900) quote supports the notion that too much knowledge can be a bad thing. We need Wisdom to temper our thirst for knowledge and it is with Wisdom that we must use (or choose not to use) the knowledge (and power) that we do have. Nuclear technologies and weapons being the prime example (among many) of potentialy dangerous knowledge and power that require wisdom in deciding their use. Moderation is the key to Happiness. A little bit of everything really does do you good – the trick is knowing how much a little is! For the purposes of this Universal Truth the concept of moderation is specific to finding the mean, or middle ground, between the extremes of excess and deficiency in ALL things – for only there at the prime or optimum amount can the benefit or virtue of a thing be found. The philosophical idea of moderating one’s thoughts and behaviour being a virtuous path that culminates in the achievement of a Higher Purpose or Ideal Self (or, less philosophically perhaps, a happier and healthier life) has long been with us. Moderation is synonymous with the notion of Temperance – one of Plato’s (and Christianity’s) four cardinal virtues and a principle that is also found in eastern traditions such as Buddhism and Hinduism. It is also one of six virtues in modern Positive Psychology classification. Solon of Athens (7th century BCE), said to be one of the Seven Sages of Greece and responsible for framing the laws that shaped the Athenian democracy, stated “Keep everything with moderation”. 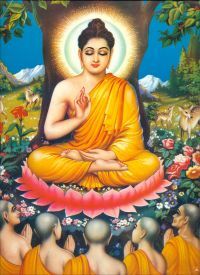 The Buddhist Middle Way (6th century BCE) taught that a Central or Middle Path between the extremes of religious asceticism and worldly self-indulgence (or between the extremes of self-mortification and sensual indulgence), leads to liberation and enlightenment (or inner happiness). The Confucian “Doctrine of the Mean” (5th-4th century BCE) teaches of attaining the highest order of virtue – a state of joy, peace and contentment. Its guiding principle is that one should never act in excess but maintain balance and harmony by keeping one’s mind and actions in a state of constant equilibrium. The Temple of Apollo in Delphi (built 7th-4th century BCE) had three phrases carved into stone above the entrance within its forecourt: “Know Thyself”, “Nothing in Excess” and “Go Bail and Ruin is at Hand” (i.e. no good deed goes unpunished). states that all that is good (or virtuous) in this life is a balancing act between two evils; a greater, active, indulgent evil (a vice) and a lesser, inactive, passive one (a flaw). Aristotle makes clear in his Nicomachean Ethics the assertion that a virtuous life was a happy life. Although Aquinas agrees with Aristotle that happiness is linked to virtue, he believed that true (or absolute) happiness was only attainable in an after-life with God. … and, lets face it, enough is also much more preferable than a famine. Put another way – the right amount is as good as too much, and is certainly way better than too little. … a little being just the right amount to enjoy or feel the benefit of something. It should be worth noting that a little bit of what you don’t fancy does you good too… consider the principle of vaccination and the practice of Mithridatism (protecting oneself against a poison by gradually self-administering non-lethal amounts). The Priory of Universal Truth is drawing up a list of Universal Truths HERE. Learn and Master these truths and your Ideal Self can be attained. The University of Life, the Universe and Everything holds ALL the answers… possibly! Studying at the University of Life, the Universe and Everything should be considered a metaphor for the sometimes steep learning curve that is the Life of a Modern Human. Life is an education from start to finish. Experience leads to the knowledge of truth and to a healthy respect for stark reality. The path to truth in all its forms leads to understanding, wisdom and ultimately Gnosis… and presumably a VERY dark sense of humor for a cold hard truth can be life-changingly harsh, but can also bring out the Schadenfreude in us all… it’s a survival thing. Check out the University’s webpage HERE. Or ‘like’ the University’s Facebook Page HERE. The University of Life, the Universe and Everything is the nature, science and humanity Chapter at the Priory of Universal Truth. Soon you will be able to discuss and debate the veracity of some of the current theories answering those great questions that have vexed us and our fore-bares since we were first able to look up at the sky, scratch our heads and wonder… what, why and when? The Priory of Universal Truth is simply a fellowship of agnostic know-it-alls out to solve the world, its mysteries and its problems! The Priory of Universal Truth is not a religion, sect or cult; and has no affiliations with any religious organizations. A secular institution, the Priory is inspired by a monastic model of scholarly research and esoteric exploration in a serene and reverential space. There are no priests or priestesses, simply Brothers and Sisters joined in Fellowship and in search of Universal Truth. The Priory’s only instruction to its members is to eagerly study, speculate, discuss and disseminate – all with the guiding hands of spirited openness and self-limiting skepticism – in hope of providing a theoretical cosmology set firmly within the realms of possibility & probability while looking for insight into the great Universal Questions of life, the universe and, yes… everything – AND – while looking to expose those Universal Fallacies intended to keep the ignorant ignorant. This fellowship is also for anyone wishing to discuss any of Harbinger451’s many other projects and for anyone interested in all things alternative… to join the Fellowship of the Priory of Universal Truth simply subscribe to this blog, follow Harbinger451 on Twitter or ‘like’ either Harbinger451’s Facebook Page or The Priory of Universal Truth’s Facebook Page.